Sun Dial Press, Garden City, New York. Reprint Edition 1945. Hardback, no dust jacket. A series of stories by Damon Runyon that were originally published in Collier’s Weekly and Cosmopolitan magazines. The book contains the short story ‘The Idyll of Miss Sarah Brown’ which is one of the stories developed into the musical ‘Guys and Dolls’. The outer boards are scuffed and bumped. The inner pages are clean. This book has obviously been on someone’s shelf for years but is a delightful book. Damon Runyon was best known for his short stories celebrating the world of Broadway in New York City that grew out of the Prohibition era. He was also a well-known newspaper reporter, covering sports and general news for decades for various publications and syndicates owned by William Randolph Hearst. This book is dedicated to Hearst. 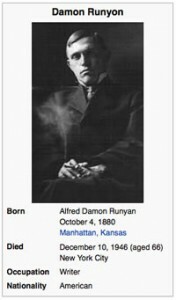 Click on the image to read about Damon Runyon on Wikipedia.